The rhizome of perennial herb-Coptis chinensis Franch or C. deltoidea C. Y. Cheng et Hsiao or C. teeta Wall. of family Ranumculaceae. Mainly in Sichuan, Hubei provinces of China. C. deltoidea C. Y. Cheng et Hsiao is mainly from Hongya, Emei in Sichuan province of China, C. teeta Wall is mainly from Yunnan province of China. Big, strong, and hard with reddish yellow cross section. Unprocessed, or prepared with ginger or wine. Bitter, cold; heart, stomach, large intestine and liver meridians entered. Clear heat and dry dampness, purge fire and relieve toxicity. For its strong property of being cold, descending, bitter and dry, it has stronger actions of clearing heat and drying dampness comparing with Huang Qin and Huang Bai and is good at entering middle energizer and large intestine meridians to dispel dampness and clear heat. It is commonly used for dysentery, vomiting due to damp-heat as one of the essential herb for damp-heat. For slight case, using the single one is enough, such as Ren Zai Zhi Zhi Fang; it is often combined with Huang Qin, Huang Bai and Bai Tou Weng to strengthen the actions of drying dampness and removing toxicity, and clearing heat and checking dysentery, such as Ge Gen Huang Qin Huang Lian Tang and Bai Tou Weng Tang from Shang Han Lun. It is commonly combined with qi-moving herbs such as Zhi Qiao, Mu Xiang, Bin Lang for treating dysentery with pus, blood or mucus, tenesmus due to damp-heat and qi tagnation and blood stasis. For instance, it is combined with Mu Xiang in Xiang Lian Wan from Bing Bu Shou Ji Fang (Prescription Manual from Military Department). It is also combined with Huang Qin, Bing Lang and Dang Gui, such as Dao Qi Tang from Su Wen Bing Ji Qi Yi Bao Min Ji with prominent effects. It is commonly combined with dampness-drying, dampness-resolving and qi-moving herbs when damp-heat accumulates in spleen and stomach with failure of qi ascending and descending, manifested as stuffied epigastrium, vomiting and nausea. For instance, it is combined with Hou Po, Zi Su Ye, Chen Pi, etc. , as in Lian Po Yin from Huo Luan Lun (Treatise on Choleraic Turmoil), and Huang Lian Su Ye Tang from Shi Re Bing Pian (Chapter of Damp-Heat Disease). It is also indicated for many damp-heat syndromes, such as jaundice, stranguria syndrome or syndromes of eczema and damp sores, and the damp-heat of liver, gallbladder and bladder. It has wider actions on clearing heat of multiple organs, but specially clearing excess heat of heart and stomach meridians. Therefore, it has better therapeutic effects for clearing excess heat of heart meridian. It is commonly combined with heart-clearing and fire-purging or heat-clearing and toxicity-removing herbs when treating high fever, irritability, dizziness and delirium due to excess heart heat of external-contracted diseases. For instance, it is combined with Lian Qiao and Niu Huang in Cui's Huang Lian Jie Du Tang from Wai Tai Mi Yao (Medical Secrets of an Official). It is combined together with heart-clearing and tranquilization-inducing herbs to treat irritable insomnia due to excess heart fire. For instance, it is combined with Zhu Sha and Raw Gan Cao in Huang Lian An Shen Wan from Ren Zhai Zhi Zhi Fang. It is combined with yin-moistening and blood-nourishing herbs to treat deficiency irritable insomnia, palpitation due to exuberant heart fire. For instance, it is combined with E Jiao, Bai Shao, Huang Qin in Huang Lian E Jiao Tang from Shang Han Lun. It is often combined with Rou Gui such as Jiao Tai Wan from Si Ke Jian Xiao Fang (Simple and Effective Prescription in Four Department) to treat palpitation with insomnia due to heart fire flaming up and disharmony of heart and kidney. It can be used singly for treating mouth and tongue sores due to flaming up of heart fire or combined with heart-fire-purging herbs or stranguria-relieving diuretics. For instance, it is combined together with Zhi Zi and Zhu Ye, as in Qing Xin Dao Chi San from Yi Zong Jin Jian mainly for treating kids tongue thrust, irritable heat, dark and unsmooth urinating. 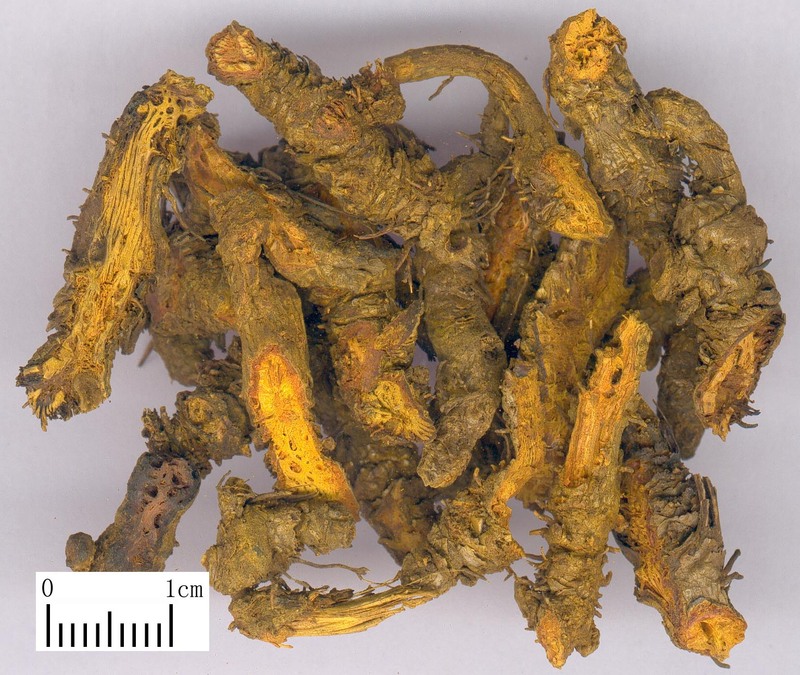 It is combined with blood-cooling and bleeding-stopping herbs to treat hematemesis and non-traumatic hemorrhage due to exuberant fire forcing blood flowing out of vessels. For instance, it is combined with Huang Qin and Da Huang in Xie Xin Tang from Jin Kui Yao Lue. It is used for various diseases due to excess stomach fire for it has strong actions on clearing stomach heat. For instance, it is often combined with stomach-heat-clearing herbs to treat toothache, swollen, rred and bleeding gum due to stomach fire. For instance, it is combined with Shi Gao and Sheng Ma in Qing Wei San from Wai Ke Zheng Zong. It is used with stomach yin-moistening herbs to treat diabetes due to stomach heat. For instance, it is combined with Sheng Di in Xiao Ke Fang from Dan Xi Xin Fa. It can be used for various diseases due to liver heat because it has actions of clearing liver fire. It is often combined with pain-stopping and vomiting-stopping herbs to treat distending pain in the hypochondrium with vomiting and acid regurgitation. For instance, it is combined with Wu Zhu Yu in Zuo Jin Wan from Dan Xi Xin Fa. It is combined with Da Zao in Huang Lian Jian from Seng Shen Ji Fang (Prescriptions collected by Monk Shen) to treat red and painful eyes due to liver heat. Because it has stronger actions of clearing heat and removing toxicity than Huang Qin and Huang Bai do, it is commonly-used herb for treating dermal sores and abscesses due to exterior heat toxin. Taking orally is possible. For instance, it is combined with Jin Yin Hua, Huang Qin and Lian Qiao for treating the early stage of sores, abscesses, deep-rooted boils and furuncles manifested as red swollen pain due to heat-toxin. In many cases, it is used topically and externally. For instance, it is made into ointment with Huang Bai and applied on the affected area topically. For clearing heat and removing toxicity, it can be used for burns with red-swelling and burning pain. Its actions of treating dysentery are closely related with the effects of clearing heat-toxin of gastro-intestine. Decoct 2~10g. It has stronger heat-clearing actions when using the raw one. Frying it can moderate its bitter and cold property. The one prepared by ginger is commonly used for stopping vomiting and clearing stomach. The one prepared with wine is commonly used for upper-energizer heat syndrome. Proper dose is for external application. It is contraindicated for deficiency-cold syndrome. Because its taste is extremly bitter and dryness, overdosage and long-time taking will impair spleen and stomach, yin and fluids.